I personally loved getting to see Luc take charge and prove just how much he loves Corinthe. I’m not going to lie that in hindsight his falling for her in Fateswas a bit unrealistic and didn’t seem very substantial but Bross does an excellent job at solidifying his emotions toward her character. Corinthe becomes more than just some mysterious girl and into someone that could be described as a soul mate. All the lengths that Luc goes to to save her completely won me over and broke my heart. All I can say is that Corinthe is one lucky lady. There are two new additions to the story. The first being Luc’s younger sister Jasmine being introduced as a new protagonist and the conflict from Fatescrossing over and into Chaos. As Luc deals with the figures that stand in the way of his being reunited with Corinthe, Jasmine deals with the repercussions of what happened to her character in the last novel. All these new problems and added mysteries really took Chaos to new distances that left me awed. I would recommend the Fates novels to readers who are looking for a story that is half-teen fiction, half-romance and half-fantasy. 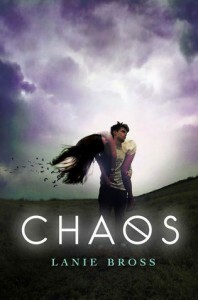 Readers who previously readFates should definitely continue the story and pick up Chaos. Any readers who want to fall in love with two characters while they fall in love should also give Bross’s novels a go.